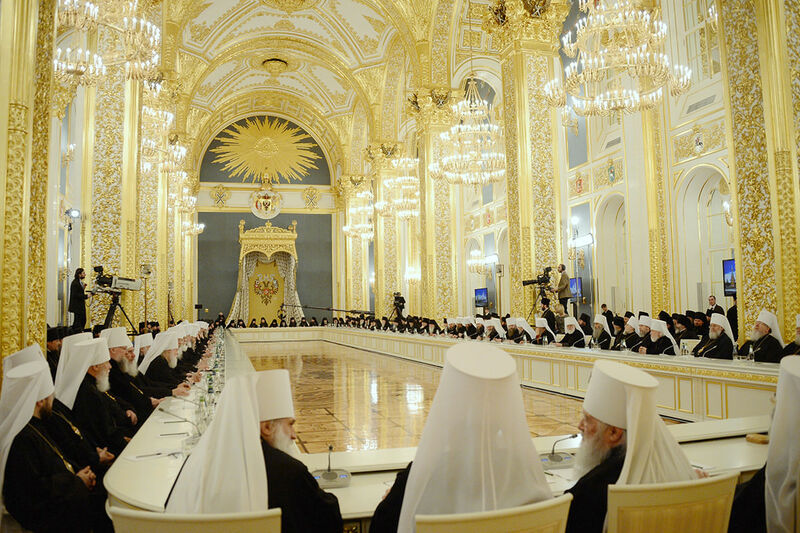 The photography page also shows the bishops’ meeting with President Putin in the Andreyevsky Hall of the Grand Kremlin Palace. What a sight! Aaron and I walked past that lovely building but we did not get to go inside. The main halls are imperial, indeed. It is Clean Week, the first week of Lent, when we Orthodox sing the Great Canon of Saint Andrew of Crete. At this time, even American Greeks stand for the services! I am naughty to tease my brothers, but I do so as a witless introduction to an Orthodox History article on pews in Greek American parishes: “Pews (or lack thereof) in early Orthodox churches.” The common oral history is that Greeks and Arabs adopted pews because they used, borrowed, or purchased Western Christian buildings when they were too few, new, and poor to have their own properly arranged temples. Then, the story goes, the pewy habit stuck with them. The article states that this explanation contradicts the facts. It seems that Greek parishes installed pews on their own after the 1920’s. I blame the calendar change—the closest thing to Vatican II that certain Orthodox Churches have experienced—and the desire by Greeks to emulate the Protestant American establishment. Such reminds me of a jocular statement by Dr. Kalvesmaki when he overheard other jurisdictions’ disparagement of pews in Greek parishes. He said that the pewless Orthodox have it so easy and convenient. For when Greeks bow and prostrate themselves in the services, they must contend with suitable obstacles and they have to shuffle to aisles. This facilitates ascetic growth, whereas wide open spaces in the temple are for the lazy and careless. I wish my fellow Orthodox readers a blessed Clean Monday and a beneficial Lent! Father Edward Hughes—a priest of the Antiochene Patriarchate rather than the well known Latin exorcist by the same name—has an informative essay on the history of fasting and abstinence in the East and West: “Fasting and Abstinence: Similarities and Differences in Development between the Byzantine East and West and some Pastoral Considerations.” As Clean Week begins, you may wish to know the development behind our practice. If it were a leap year, tomorrow would be the feast of Saint John Cassian. As it is, we celebrate the good saint’s feast on February 28 (March 13 on the Gregorian calendar). On my patron’s feast day last year, Fr. 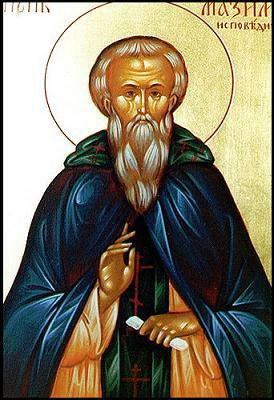 Stephen De Young published a decent article on John Cassian on Orthodoxy and Heterodoxy: “The Curious Case of St. John Cassian.” I recommend it. It is yet another reminder of how the preponderance of Saint Augustine in Western Christian thought—without adequate patristic counterweight—has perverted the West. I do not quite understand how it happened, though. Even without the multitude of voices from the Greek fathers, the West still had Hilary, Ambrose, John Cassian himself, and others, though I suppose that Augustine’s writings were so vast and impressive that they overshadowed the rest. Still, it was not until the Reformation that the balance truly tipped, but why then? Why did Luther, Calvin, and the gang draw their inspiration from Augustine’s extreme anti-Pelagianism? Was it their rejection of scholasticism and the medieval tradition, where the next previous stop in history was Hippo? Did they find a soulmate in the “Doctor of Grace”? Why did a Platonist from late antiquity appeal to the nominalists who transformed post-Renaissance Western Europe? Curious, indeed. With the title, I refer not to the expected increase in sexually transmitted diseases among the members of the Anglican communion as a result of their slippery K-Y coated slope of discarded morality. Rather, I offer you “The Anglican Itch” by Cyril Jenkins in Orthodoxy and Heterodoxy, wherein Jenkins responds to Anglican counsel against conversion to Orthodoxy. As religious polemics go, the Conciliar Anglican’s post is as genteel and polite as one would expect from Canterbury’s better half. It reminds me why I like the Anglicans—and why my heart aches when I witness their troubles. However, they now have Anglicanorum Coetibus from Rome and the Western rite from us. 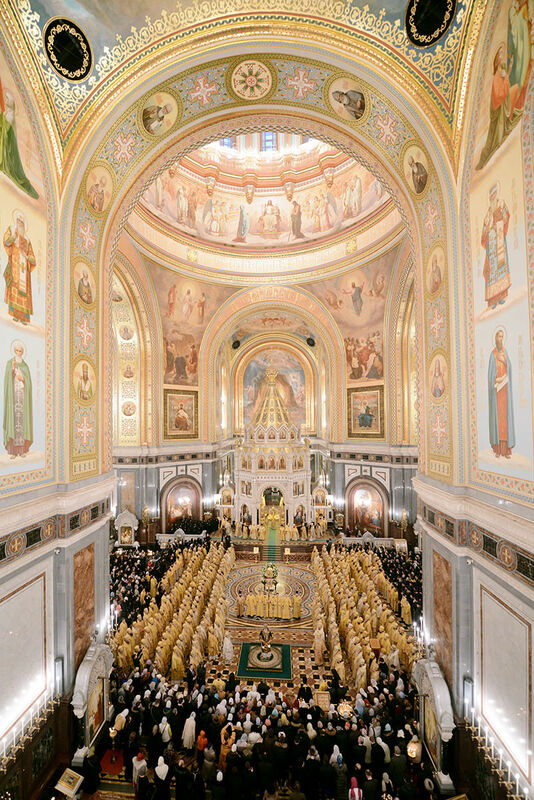 Their return to Catholicism has never been easier, and yet few swim the Tiber or the Bosphorus (or should we say the Volga nowadays? ), as I note in “Joseph Julian Overbeck.” I blame inertia more than pride, and nothing will shock them to move if the apostasy of the last decades has not yet created a stir. Such reminds me of a joke that I heard as a young’un, where two pious Episcopalians are sitting in the pew as a lesbian priestess in African garb blesses an elephant carrying depictions of Hindu deities while her lover does an ad-lib liturgical dance to pagan odes in honor of Gaia sung by a transexual men and boys choir. One of the gentlemen leans over to the other and testily whispers, “If they change one more thing, I’m out of here!” No—no, John Doe remains, ever the long suffering beautiful WASP unwilling to make a fuss. Bruce Charlton posted a typically charltonesque apologia for the Christian life in “An evangelical Q & A - salvation, theosis, families.” It is worth your time.